Send network faxes via HylaFAX server. Is there a better alternative to MacHylafax? Is MacHylafax really the best app in Applications category? Will MacHylafax work good on macOS 10.13.4? 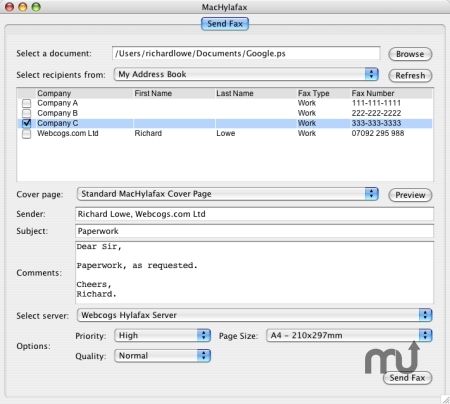 MacHylafax is a network fax client for Mac OS X that allows you to easily send faxes via a HylaFAX server (an enterprise-class fax server solution which is freely available). Features include integration into the Address Book, custom cover pages, multiple server profiles and more! A 14-Day demo copy is available for you to try out. MacHylafax needs a rating. Be the first to rate this app and get the discussion started!